Ruth has supported charities most of her life, her early memories are of giving away her favourite teddy bear as there had been some awful natural disaster and she felt wretched about the children not having a favourite toy. She sent her teddy along with blankets to those in need in Armenia. As she got older Ruth found volunteering hugely rewarding and went to Madagascar for a 3 month conservation and humanitarian trip that changed her life! She volunteered for SEED in Madagascar and not only built a school, taught in a school in a different village, delivered health education, built wells, collected and planted seeds to grow tree nurseries which would go on to build corridors between isolated parts of remaining forest, increasing the likelihood of biodiversity surviving. Only 10% of forest is left of Madagascar, with all the animals endemic to the island, their survival relies on the gene pool being diverse enough to create strong babies. Ruth lived in a tent for nearly 3 months, living without electricity, flushable toilets or hot running water. With water being pumped from a nearby well it was rationed to only 1 bucket of water for personal cleaning a day, eating like the locals, beans rice and whatever fruit was in season. Ruth had an encounter with a wild lemur that stayed with her and changed the way she thought about the animal kingdom forever. You can read about that in PICK ME UP! Magazine. Punarbal Plus in Kathmandu, Nepal provides a home, meals, clothes and education for its residents aged 4 -16 years of age, all of whom are displaced by poverty and HIV. Due to the relative short stay (less than 3 weeks) Ruth stayed mainly behind the scenes with getting their newsletter up and running and other marketing and admin assistance, as well as joining them for a day trip to the local zoo (not for the feint hearted!) and shared lunchtime playtimes skipping and colouring with the children. What struck Ruth was just how happy the children were, how they shared their stories and explained how they were different in an orphanage, how the typical constraints of society in their culture it is a cast system (likened to our class system) and how they celebrated all religious major holidays and festivals. Despite the adverse beginnings these children had, health concerns and stigma of their illnesses, they were filled with hope and education. Of course they relished the chance to practice their English and see their face on a screen too! Ruth’s love of animals is at the core of why and how she ended up being part of the team at Hopefield Animal Sanctuary. At a vision-boarding workshop the host asked the question “if money were no object, what would you be doing with all of your time?” Ruth answered this to herself that she would be at an animal sanctuary helping out in any way she could. The thing is Ruth attended two of these workshops in a 12-month period and she stopped at the second of the two and thought to herself “you need to make this happen”. 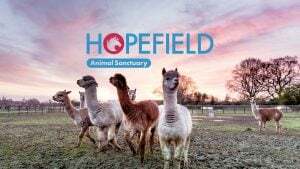 After a bit of to-ing and fro-ing around which charity to help, Ruth and one of her animal loving friends chose Hopefield Animal Sanctuary in Brentwood, Essex. They provide a home for life to their 500 unwanted, rescued or abandoned resident animals. Many of the animals have had very poor treatment and really do need a lot of extra care, veterinary attention and peace and quiet. The sanctuary is only open to the public 11-4, Friday to Monday and has a small dedicated team of staff and much larger team of volunteers. The staff look after the medicine, additional care, more involved handling and animal husbandry where the volunteers, clean and muck out beds, make up and give out meals, and generally provide man power. Ruth absolutely adored her volunteering days at Hopefield and enjoyed getting stuck in with whatever needs doing on that day. One visit it was repairing some fencing, moving some old rubbish to the recycling area, and poo picking up in the miniature ponies field, as well as moving one very old lady miniature back out to the paddock after she’d had her special feed, what a rewarding day!